The German Shepherd moves through the group with something more than confidence. She is genuinely enthusiastic. Her arrival is welcomed with comparable excitement as the students vie for her attention. 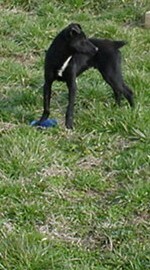 Some claiming that she always brings the ball to them and others that she always insists on having them chase her to get the toy away. 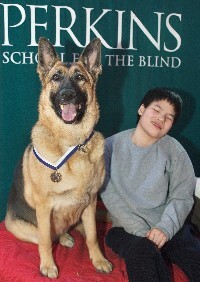 For over 175 years, students like these have benefited from the education and guidance received at Perkins School for the Blind in Watertown, MA. It's only been in the last few years, that they've also been able to enjoy the friendship and companionship of Garnet, a 90 pound German Shepherd female. Click on either photo of Garnet and friends to go to their site. Terri Werner, Perkins School's Art Instructor and Garnet's owner and trainer, laughs and explains the discrepancy. Garnet, it seems, is always aware of each child’s abilities, and she modifies her behavior accordingly. Kids in wheelchairs are given back the ball when she plays with them; kids who can run are invited to chase. It is not something she was taught, Terri explains. Perhaps these skills and her own innate talents explain why in February 25 2004, Garnet was awarded an honorable mention in the AKC Award of Canine Excellence. Her award ceremony was attended by many of the students at Perkins and included a performance by eighteen year old Daniel Nordin of James Taylor's "You've Got a Friend". 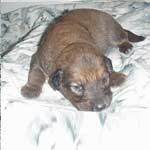 Terri was thorough in her work with Garnet and pursued an AKC CGC (Canine Good Citizen) and TDI (Therapy Dog International) certificate. The training and socializing necessary for both of these helped Garnet assume her responsibilities at Perkins confidently. Since then, keep in mind that so far, Garnet has contributed over 1000 hours as a volunteer. This is above and beyond as 100 hours is considered exceptional for a Therapy Dog. 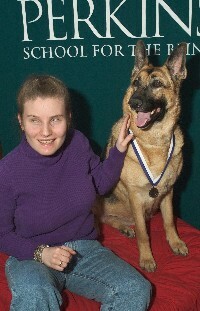 Terri has trained service dogs for more than 35 years. Garnet’s judgment continues to amaze her. One example is Garnet's penchant for choosing one child each year as a favorite. Though she is univerally friendly and gregarious, her chosen child invariably emerges as the one with the most challenges. At the school, Garnet's role is to be supportive, confidence building and motivational for the students. Judging from the popularity of "Garnet-time", one on one sessions between a student and Garnet, she is very good at her job. Perhaps Garnet's sensitivity relates to her own health issues. Her respiratory issues have led to several surgeries and even now she is susceptible to pneumonia and noted for some messy sneezing. Somehow, even that quirk makes her more charming to her charges. Garnet’s abilities defy simple cataloging. In addition to the skills referenced above, she detects oncoming seizures in the students so afflicted at the school. Other environments require other skills, like her inclination to "herd" Terri's nieces and nephews when they come to visit! Not surprising, she was a devoted companion to Terri after breaking her back. From moral comfort to a physical force that pulled Terri and her wheelchair to the cafeteria for meals at the rehabilitative facility. Somehow it seems appropriate that after everything Terri and Garnet have done for others that they had this exceptional time for one another. Terri's remarkable recovery is just another blessing attributed, in large part, to Garnet. Ultimately the only thing that Garnet has any trouble tolerating is Friday -- the one day of the week she doesn't accompany Terri to the school. No doubt that frustration will increase as Garnet approaches 7 years of age and plans to retire her are put in place.